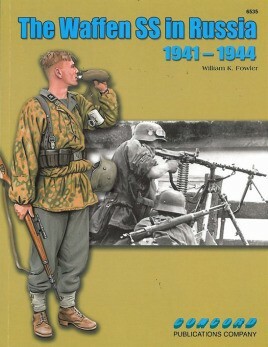 Unfortunately, due to sales rights restrictions, we cannot offer 6535: The Waffen SS in Russia 1941-44 for sale in your country. The volume begins with a description of the role played by this elite fighting formation commanded by Heinrich Himmler. After the initial giddy successes subsequent to the 1941 invasion of Russia, the Wehrmacht and Waffen SS both eventually ran out of steam at the very gates of Moscow. The SS had grown from a force of 141,975 fighting men in September 1942 to 280,000 soldiers a year later. This statistic illustrates the importance attached to the formation, and how resources for it were prioritised. New divisions with names like‘Nordland' and ‘Wiking' were established, joining others like ‘Totenkopf' and ‘Das Reich'. However, the ability of the Waffen SS to extinguish hotspots could only delay Germany's inevitable defeat. This book, through the extensive collection of photos, traces the exploits of these elite soldiers in all areas of the Russian frontline and in all kinds of weather conditions. The black and white pictures show all manner of equipment and weapons in use. In the center of the book is the familiar set of four colour plates that characterises this series. The artwork has been prepared by Dmitriy Zgonnik, and they show SS soldiers in various kinds of uniforms and with different weapons.